As fifteen year residents of Puerto Vallarta, we have seen it grow from a relatively small Mexican resort to a bustling, internationally recognized vacation and retirement destination. It seems to get more beautiful and more visitor friendly every day as we watch the dramatic changes continue to unfold in front of us. A few years ago, the city built a modern convention center which has attracted numerous large national and international conventions to the area; the number increasing each year. This year alone, they hosted the Mexico Nuestra Belleza beauty pageant (this pageant often determines the contestants to represent Mexico in the Miss Universe, Miss World, and Miss International pageants), an International Meeting of Journalists conference, and PV was recently selected to host Mexico’s 27th National Medical Conference with 3,800 medical related attendees.Added to those events, Vallarta recently hosted a number of competitions for the XVI Pan American Games. Also, just in the past couple of months, President Calderon came to PV to speak at the Tianguis Tourism Conference where Vallarta hosted about 7,000 conferees from all over the world. This international convention was followed three weeks later by the World Economic Forum for Latin America which hosted approximately 900 leaders from 70 different nations. Again, President Calderon spoke to the attendees and played an integral role in the convention. In order to prepare for all these significant conventions and international events, the city leaders decided to invest a small fortune and give the city a facelift, a complete makeover. With federal and state funding, and a huge amount of local manpower, in a period of less than six months, the city has transformed itself into a showpiece. Included among the changes were fresh paint striping of the local roads around town (lack of striping had caused some of them to become dangerous…now, the traffic tends to flow in lanes rather than be a free-for-all! ), painting the curbs, crosswalks, and topes (speed bumps that can, without prior warning, ruin your wheel alignment and suspension system, destroy your wheels and tires, or even worse, wipe out the entire undercarriage of your car), painting the base of the palm trees (they painted virtually everything that didn’t move! ), repairing sections of the main bricked road and service roads through town, laying a new concrete highway south of town, replacing the dilapidated Los Muertos pier with a brand new modern pier, and they decided to rebuild all of the sidewalks and curbs in the Downtown and Old Town areas. Being quaint is one thing but having sidewalks and curbs that were poorly built 50 years ago and now crumbling and heaving in every direction is another thing. Not only were they unsightly but they were quite dangerous, especially if you weren’t paying attention to where you were walking. The sidewalks were so pathetic, that we had to constantly remind our visiting friends to watch every single step they took while walking downtown. If you looked up for just a second, you stood the chance of spraining an ankle, or worse. The curbs were a mess and especially bad at the street intersections; wheelchair access? You’ve got to be kidding! As a side note and as an example of how inattentive visitors can be, about 10 years ago, just for entertainment while having lunch, we ran a survey to see how many tourists were paying attention to where they were walking. The restaurant we were dining in gave out phony $20 US bills as some kind of promotion encouraging a return visit. Well, we took one of these bills (an excellent counterfeit bill!) and we folded it in half and then in half again. We placed this beautiful crisp new folded $20 bill on the sidewalk where many tourists were strolling by. At least 200 people walked virtually right over it and none of them glanced down; they were all preoccupied looking in the local shops or taking in the sights and sounds of the area. As we left the restaurant, we retrieved the folded bill and used it for a discount on our next visit! Since they were rebuilding all of the sidewalks, the city planners decided to make the entire city more pedestrian friendly. In order to do so, many of the sidewalks, especially on the main routes through Downtown and Old Town, have been doubled or even tripled in width. In fact, the entire street along the Malecon is now designated as a pedestrian area and virtually closed to automobile traffic. Fortunately, the city has three new parking garages to accommodate those that would rather drive to town than take a cab or walk. The new sidewalks are not just plain vanilla sidewalks; they are highly decorated sidewalks with pebble stone inlays and planters along the way. 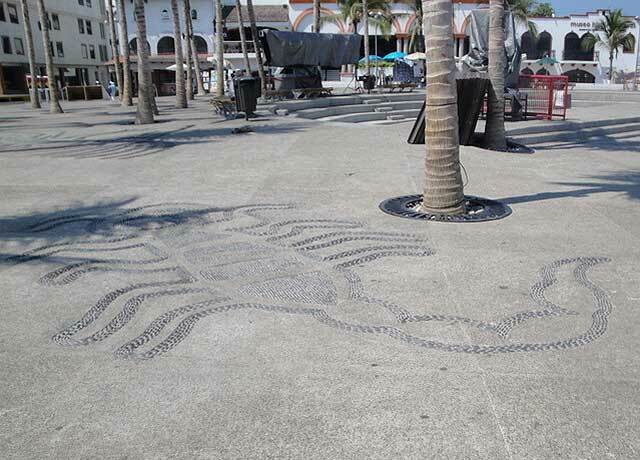 Fidencio Benitez, one of the local Huichol Indians, using the “Mosaico Vallarta” technique, designed the entire network of sidewalks throughout town. 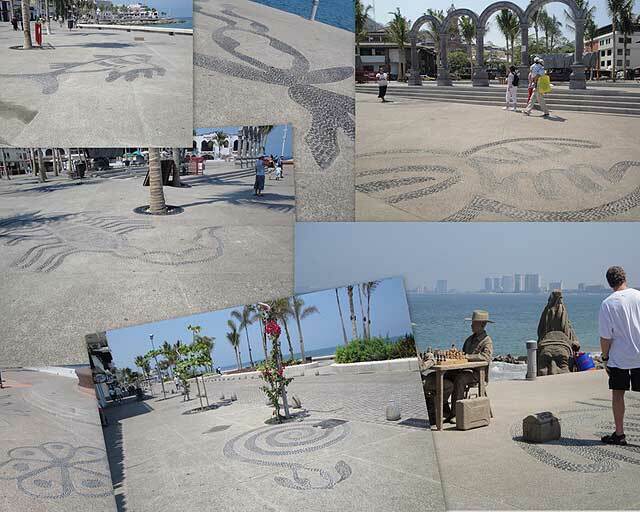 Senor Benitez incorporated in his design the “Origin of Vallarta” or a place where the “Motherland meets the Ocean”. Every single little cobblestone and volcanic pebble is placed by hand in the concrete resulting in an intricate Indian pattern everywhere you walk. The problem is; now that it’s safe to let your eyes wander all over the place while admiring the sand sculptures, stacked rocks, or mimes along the beach, or gaze at the breathtaking Sierra Madre backdrop, or peek in one of the art galleries, restaurants, cantinas, curio shops, etc., most of the tourists are too often looking down admiring the artistry in the sidewalk. Not only have all of these changes impressed the international visitors but they have made touring, or for that matter, living in Vallarta much safer. After all, one of the first questions that North Americans have about visiting or moving to Mexico has to do with safety. We always seem to think of safety in terms of theft, robbery, or some violent personal attack but seldom in terms of falling down and breaking something! Until the sidewalks were rebuilt, they were a real safety hazard, especially for tourists that were accustomed to nice, flat, smooth, predictable sidewalks. The sidewalk changes have been a major improvement for everyone except perhaps the hospital emergency room attendants and the local orthopedic surgeons! The new sidewalks also provided the city planners an opportunity to bury most of the electrical and telephone cables thereby eliminating the old third world look of electrical lines running haphazardly all over the skyline. Furthermore, the new Malecon was designed and constructed to permit run off rain water from the mountains to flow under the Malecon to the bay rather than flood the downtown area. In this regard, the new sidewalks not only improved the aesthetics of the city but they improved the functionality of the city, especially in the summer during the rainy season. 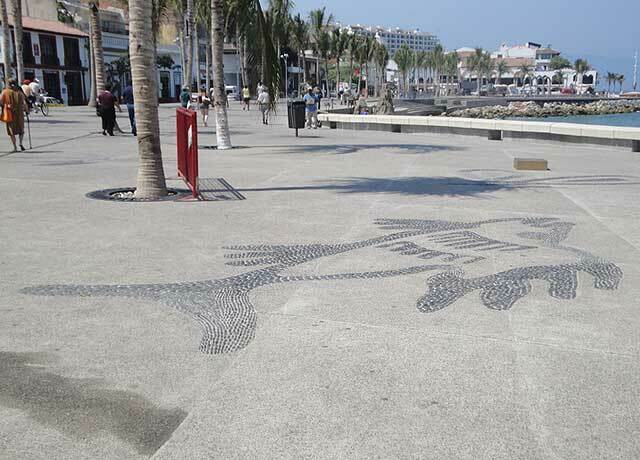 As insignificant as it may seem, these new sidewalks have positively altered the entire feeling of being in Vallarta. While maintaining its charm as a Mexican coastal resort with cobblestone roads, white stucco buildings with red tile roofs, and flowers everywhere, Vallarta now has a newer, fresher, cleaner, and safer feeling about it. Many of our friends obtain a great deal of entertainment and pleasure (not to mention, exercise) from just strolling leisurely about town. “Street walking” is fast becoming a popular pastime for all of the local citizenry. Those of you that have previously been to PV will instantly feel the difference; those of you that haven’t, are in for a real treat. Now that Vallarta has become pedestrian friendly and concurrently, even safer than it was before, we hope you’ll be encouraged to consider visiting this magical city in the near future. Who knows, you too may become a part time “street walker”!